The Heart (IC 1805) and Soul (IC 1848) Nebulae are vast star-forming regions located approximately 7.5 thousand light years away in the constellation of Cassiopeia - in the Perseus arm of the Milky Way. The Soul Nebula is also referred to as the Embryo or Fetus Nebula (more in keeping with its actual shape). This complex is 580 light years across and spans 5.5 x 3.0 degrees in the sky, an area much larger than the full moon. It was first discovered by William Herschel in 1787. 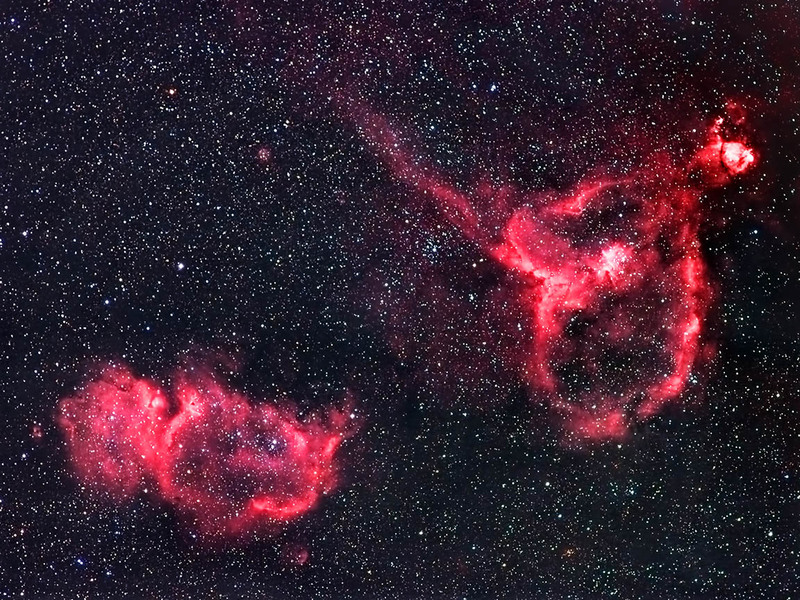 The section he first observed was the bright, knotty section of the Heart Nebula (seen in the upper right corner). It has its own designation: NGC 896. There are several open star clusters within each nebula. They contain relatively young stars (2 million years old). Their stellar winds contributed to the nebula's shape . Ha: 16 @ 7.5 min. Color: 26 @ 5 min. Ha images were focused, captured, aligned and combined in CCDSoft. Color images were aligned and combined in ImagesPlus. The composite images were aligned in RegiStar and were combined and adjusted in Photoshop CS6. Topaz DeNoise and Detail were utilized. My backyard in southeastern Minnesota between 11/22/18 and 12/9/18.